Born and raised in Edinburgh, Edwin G. Lucus (1911-1990) is one of the most unique Scottish painters of the 20th century. For the first time a major exhibition at the City Art Centre has brought together his work from private and public collections. Influenced by the surrealist movement in the 1930’s he made a number of works in this style but by no means all his work and by looking round the large show of over 60 pieces you can see how his style had changed over the years. This largely self taught artist was discouraged from pursuing the ‘risky’ profession of artist, instead becoming a civil servant, although he remained prolific painter. I will be running a workshop inspired by the surrealist art of Lucus later in the year, more details can be found via the Museum & Galleries website. There are some beautifully colourful pieces, full of imagination and confidence which is inspiring. Together with sketchbooks and paint sets, notes and keepsakes, these finished pieces tell the story of this surprisingly unknown Scottish artist. He had a unique and wonderful talent which deserves to be seen and recognised. 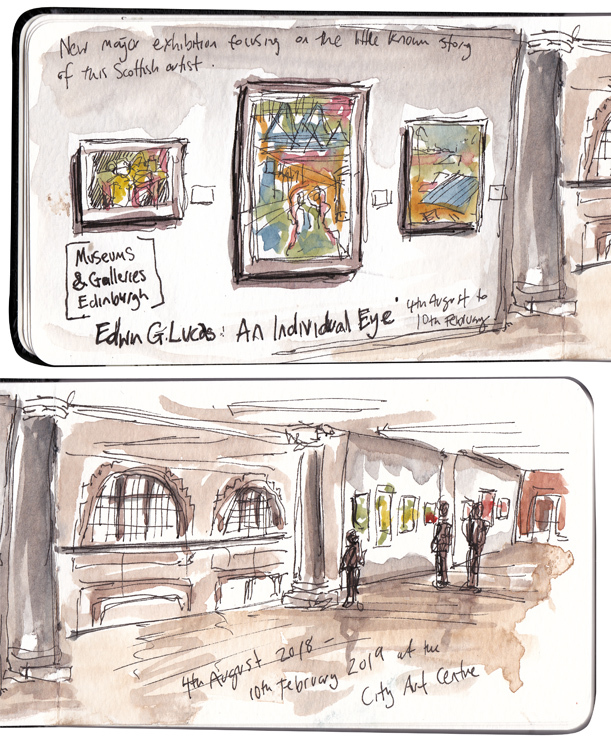 Edwin G. Lucus: An Individual Eye runs from 4th August to 10th February 2019. Free entry.